My recent experience with flight cancellation compensation from American Airlines was extremely easy and fast, thanks to some expert help. I received $1003.01 in cash compensation from AA for a cancelled flight for 2 passengers in less than 4 weeks. American cancelled our flight AA731 from London Heathrow (LHR) to Charlotte (CLT) without providing a reason. My wife and I had departed Abu Dhabi (AUH) to LHR on British Airways to connect to our AA Charlotte flight for a family reunion. While this was disappointing, I also had an email 16 minutes after the flight cancellation message confirming us on a flight at 2pm. That put us only 3 hours after our originally scheduled departure. Unfortunately the rebooking added a connection through JFK. And, after further review, I realized that the flight was departing at 2pm TOMORROW! That put us 27 hours behind our schedule and because of the connection, we would get into Charlotte 36 hours after originally scheduled. Unacceptable, AA! We eventually got to Charlotte but that required using Chase Sapphire Reserve travel insurance for a separate cancelled flight from Orlando-Charlotte. It was a long trip. A $1000 check from AA would definitely ease the pain. The cancellation in London sent me on a Google hunt for “flight cancellation compensation.” In the US you’re lucky to get a $5 food voucher for a cancelled flight. Strong passenger rights for cancellations and delays do not exist in the States. However, in the European Union (including the UK) you could be eligible for up to €600 ($695) per ticketed passenger for a cancelled flight. This is due to a law known as Flight Compensation Regulation, or European Regulation (EC 261). EC 261 is a law that applies to any airline departing from the EU. The law applies even if it’s American Airlines, United, or Delta, all American owned and headquartered companies. If they operate out of Heathrow, Paris, Amsterdam, or anywhere else in the EU then they are subject to this law. The Court of Justice of the EU has strictly interpreted this law, meaning airlines have very little room to wiggle out of paying their passengers for delays, cancellations, or denied boardings (“bumping”). This is great news for consumers, but of course the airlines don’t want to make it easy to get compensation! After going through the EC 261 compensation claim process with AirHelp, I would definitely try to do it myself next time. If I got any push back from the airline or they did not respond in a timely fashion (2-3 weeks) I would turn the case over to the professionals. Save all your documentation from the flight. Keep your boarding pass, emails, and don’t sign anything waiving your rights to compensation. Download this EU complaint form. Fill it out to the best of your ability, hand sign it, and email it to the customer service contact emails on the airline’s website. Include any documentation you think may be relevant to your claim, including cancellation emails and boarding passes. Again, if the airline is slow to respond, denies your claim, or asks for additional documentation, don’t hesitate to turn over the claim to the professionals at a travel compensation claim company like AirHelp. My Google searches revealed some horror stories of people waiting for weeks for American to respond to their compensation request. Sometimes there was disagreement on why the flight was cancelled and the amount of compensation owed. One blogger went back and forth for months with multiple emails. That did not sound like fun to me! I decided I had enough on my plate with the family reunion and called on some expert help. Outsourcing tasks you don’t enjoy is one of the best ways I have found to boost my happiness. This is especially true when the person performing the task is much more skilled or practiced at the outsourced task. I have no desire to remove my own appendix or clean my bathroom. AirHelp offers to take care of everything about your flight cancellation compensation claim. In return, they take 25% if you are compensated by the airline. This seems like a steep price, but it appears to be the industry standard for EC 261 companies. Also I think it’s a fair price if it avoids months of back and forth between me and the airline. AirHelp even has a legal action team that will sue the airline on your behalf if they refuse a reasonable claim. They handle all the legal paperwork and costs, so the airlines don't get away with stiffing their customers. They take nothing up front and don't get paid unless you get compensated. 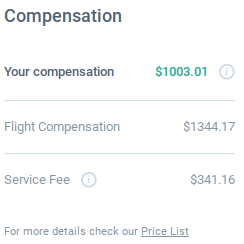 AirHelp also has a very cool flight compensation checker that automatically looks at your flight details and determines if you have a chance for compensation. After checking that my flight was eligible for compensation on the AirHelp website, I submitted my information and uploaded the required documents. I submitted all the documents on 25 July and the AirHelp team started processing the claim on 26 July. All together the process took less than 4 weeks from submitting the initial claim through AirHelp and getting the $1003.01 deposited in my bank account from American Airlines. Now that's what I call fast and satisfying service! EC 261 Claim DIY or Hire a Company? If I had another cancelled or delayed flight in the EU, I would gather my documents and email them to the customer service center at the airline and try to handle it myself initially. Keeping the 25% fee that EC 261 companies charge would be worth it if the airline pays up in less than 2 months. Now that I have seen how easily Airhelp got the compensation from the airline it doesn’t seem too difficult to try processing the claim myself and keeping the full compensation. If the airline started asking lots of questions or took more than a month to respond, then I would turn it over again to the pros at AirHelp. I think their fee is fair, especially since they handle everything and getting any compensation quickly is better than no compensation or months of back and forth stress!